Synopsis: “This Christmas movie answers every child‟s question how can Santa get around the whole world in just one night? The answer is a gloriously technically advanced North Pole operation, featuring an army of one million field elves, a vast supersonic ‘sleigh’ and a huge control center under the ice of the North Pole. But even the most high-tech operation has a margin of error… When the gift delivery to just one child in six hundred million is missed, Santa and his super-capable son Steve deem it an “acceptable margin of error”. But Arthur Christmas, the misfit youngest son can’t bear it. In a crazy rookie mission he sets out to get the last present half way around the globe in the two hours before Christmas dawns. His comical adventure reunites the dysfunctional Santa family and saves the future of Christmas itself” (Sony Pictures). Verdict: Easily the most creatively entertaining animation this year, and perhaps one of the best X’mas animated films ever. 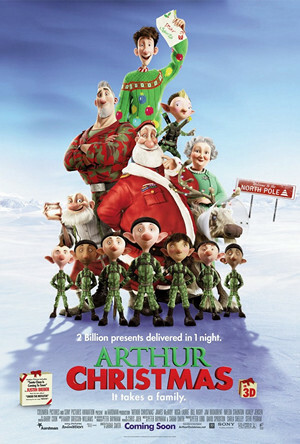 Arthur Christmas has a very fresh approach, portraying Santa and the elves with advanced technology. It is hilarious, purposeful and meaningful without having anything to do with Jesus Christ or the religion at all. Good voice acting performance by the cast as well. The only things that it suffers from are the predictable ending, decent-only CG visuals and insignificant music scores. It would also be great if they clarify Santa Claus‘ existence. Favourite scene: The beginning where Santa and his elves are on an intense mission to deliver presents on X’Mas Eve without being noticed. The whole scene is so quick paced and detailed, it’d be fun if there’s a video game on it. Indirect moral values: [SPOILER BEGINS HERE] 1 – business corporations should not neglect the real meaning and purpose of the service they provide to focus on their own benefits by taking their employees and customers for fools. 2 – the old stuffs and traditional ways of certain things may hold deeper meanings and are priceless but the older generation must admit that the modern technology can be very helpful in their lives [SPOILER ENDS HERE]. Is there a Bieber music video right before the film? No, thank goodness, not in Malaysia at least. To watch in 3D? I didn’t watch it in 3-D but I believe it’d add value to your viewing. Second opinion: “Not an ordinary animation, it’s very good” (Iris Loong). MY PREVIEW SCREENING HAD JUSTIN BIEBER IN THE BEGINNING NOOOOOOOOOOOOOO, WHY ARE YOU SPARED OF THE AGONY! I RATHER HAD THE CHIPMUNKS SPAMMING THE INTRO OF THE SHOW. hahah. dude. u become sappy kah? but yea one more in the above 4 ratings. looks like a good year end for us. THAT DAY I WATCHED GOT JB VIDEO! Yeay definitely something I wanna watch.. Awesome rating!